Hockey hand me downs are great when it comes to equipment especially for younger players. A common question we receive is what size skates do I need to buy? How long should my childs stick be? What's the right helmet? Skates: Skates are predominantly made in Canada or Europe so the American size chart does not often work. When shopping for skates try starting with one size down from the childs sneaker or shoe size. One to one and a half sizes smaller is the usual size difference for most people. 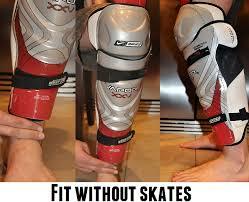 Skates should be snug (no movement inside the skate) and should be worn with light socks. Even in cold weather try to avoid doubling up on socks since this may cause blisters. The skate should be laced up using all the eyelets and should be tight. Sticks: Depending on position and ability, this may vary. Eventually the player will become comfortable with a stick length. However, for a general rule the stick should come up to the players nose/between the eyes when he is NOT on skates. See photo. Helmets: Helmets are the most important piece of equipment for any athlete. With the latest information on concussions and long term injuries to the brain from sports, helmet companies are taking notice. Improvements to helmets and rules are making the games safer. However, proper fit is crucial. Most hockey helmets are adjustable for proper fit. Take the time and read the helmet manufacturers instructions on proper helmet fit. Helmets are also checked by coaches and referees and should not be used if they are expired.